Tango, Waltz, Milonga .. 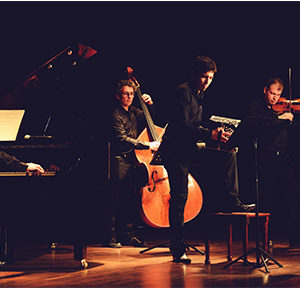 The Quartet CALIENTE proposes you a program rich and varied with compositions of the Argentine great masters of the instrumental Tango, Astor Piazzolla, Horacio Salgan, Anibal Troilo, Julian Plaza, Alejandro Scarpino and Angel Villoldo. Strength and fragility, anger and love express themselves in this journey at the heart of the tones of Buenos-Aires.